Summer is the best time to grill out. It keeps the kitchen from overheating. And I like to grill all sorts of things. Especially fish. But when pressed for time, it’s into the icebox for some Bison meat to make into burgers. These are stuffed with feta cheese, a little pressed garlic and oregano, brushed with olive oil, salted, peppered and drizzled with a dijonnaise vinaigrette. Fast, easy and just a touch more elegant than your average burger, they are equally good made with ground lamb. Prep time about 5 minutes. Cook time about 6 minutes. Consumed in about the same amount of time…. delicious. Serve with a bone dry red. 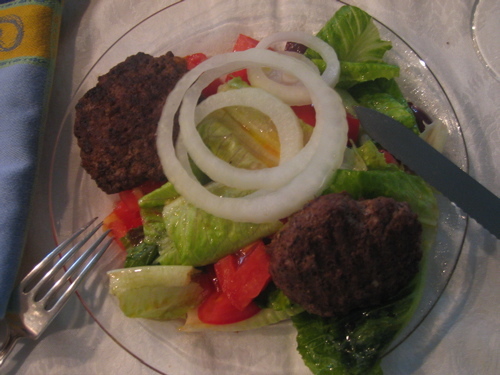 This entry was posted in Living and tagged burgers, grilling, recipes. Bookmark the permalink.